Talk about a plan coming together! We had scheduled our Canadian prairie adventure across the last couple days of September and the first few of October. Our hope was to time our arrival to coincide with the season's first major push of snow geese from their arctic and sub-arctic breeding grounds. Our dream was that the Indian summer weather gracing the prairies to that point would take a turn for the worse. And it did. The low, angry, rolling, cold-fronted scud, and gusty 20-knot-plus winds that greeted us that first morning, were just what the goose doctor ordered. The travel-weary, empty-stomached snows wanted our pea field in the worst way. Busy fighting the wind, the wavering, juvenile-laced flocks and family groups came low...some scraping the deck, others whiffling in with total abandon...sucking in to our mixed spread of silhouettes and windsocks. The shooting was at once relatively easy, but fast and furious. Though we didn't tally limits, the four of us were not far off by the time the flight ended. Now, any time we get to experience one snow goose hunt like that, the entire trip is considered a success. But when the next two day's hunts, thanks to favorable (i.e. nasty) weather and an abundance of young birds being exposed to decoy spreads for the first time, proved near carbon-copy replays of the first...well...we were on a roll! But as we hustled to deploy our decoy rig in a short-clipped wheat field that fourth morning, I was sure our luck had run out. A thick blanket of stars flickered overhead, stretching to touch the prairie horizon in every direction. It was cool and crisp, but totally still. So quiet our breaths hung in clouds that only stubbornly and slowly sank to the ground. Still, there was the optimism that began to build as distant roosted-goose music began to roll across the countryside, while the sky began to faintly show pink in the east. We'd all been snuggly settled into our heavily-stubbled layout blinds for more than 10 sweat-settling, bone-chilling minutes when our first customer...a Kamikaze single...attacked the spread: a solitary shotgun blast; a resounding "ka whomp" as the bird crashed into the frosted stubble; a streaking yellow dog scooping its prize. The hunt was on! What ensued was almost chaotic. Snows and blues began to stream to our field from the multiple roost ponds surrounding it. The unusually low-flying birds acted as if they owned this half-section of prairie they'd gorged themselves in for the past three days. It was soon apparent that nothing, not even open-topped blinds, hunters sitting or kneeling up in them, smoking guns or free-running, bird-crazed retrievers was going to keep them out. Now, everything recounted to this point may give a prospective hunter the misguided notion that chasing snow geese often amounts to a slam-dunk proposition. Most who have tried to hunt them know this. Those who would consider pursuing the Wild One, (as the snow goose is affectionately referred to by its fans), or the White Devil, (as its detractors might label it), should be aware that this game is not easy. Not by a long shot! The fact is snow geese, as their population has exploded in the past 25 years, have become so frustrating to hunt stateside that they've become almost unhuntable. And because they've become so difficult, few would-be hunters speak of the birds in anything but unfavorable, derogatory terms. To better understand this bird, hunters must realize that given its inherently wild genetics, the white goose pretty much abhors contact with humankind. Never able to adapt to a popcorn-eating, golf course-dwelling existence, light geese react to human interface (i.e. hunting pressure) by seeking the disturbance-free roosting our national refuge system and other large waters provide. There they generally roost and fly to feed in the security of huge flocks, often numbering in the thousands, and sometimes tens of thousands. Set a morning spread in a field the birds have fed in the night before...anywhere form North Dakota to Texas...and it's like running up a flag that does little more than alert the flocks, comprised of birds that on the average have been up and down the flyway more than 10 times, to steer clear of harm's way. For today's wildfowler the real dilemma is the bountiful opportunity the white goose should provide. USWFS and CWS best estimates in the joint report published in July 2004 put the breeding population of mid-continent light geese (Ross, snows and blues) at 2.15 million birds, with an asterisk noting the survey was incomplete. (There could well be as many as 3 million breeders in scattered, uncensused nesting colonies.) Compare this number of birds utilizing the Central Flyway alone to the estimated 7.4 to 7.5 million mallards surveyed continent-wide in '04, factor in 20-bird limits, and...well...light geese should provide a lot of gunning. And the good news is they do, for the hunters willing to travel to prairie Canada. Come late September the relatively small portion of the central Canadian provinces of Manitoba, Saskatchewan and to a lesser extent eastern Alberta, that extends roughly from the U.S./Canada border 300 miles north to the parklands, becomes a virtual Snow Goose Central. Here, in the vastness of the prairie, virtually all of the Central Flyway's snow, blue and Ross geese stage, feed and lead a relatively unpressured existence until winter's icy grip locks the countryside down in late October or early November. And it's here that the hunter seeking a date of two with these arguably most spectacular, most wild of our waterfowl, must go. Sounds simple. But it's not. There is a lot for the wildfowler interested in prairie light goose hunting to consider. A Canadian prairie newcomer must first decide if he wants to hire a guide or freelance. 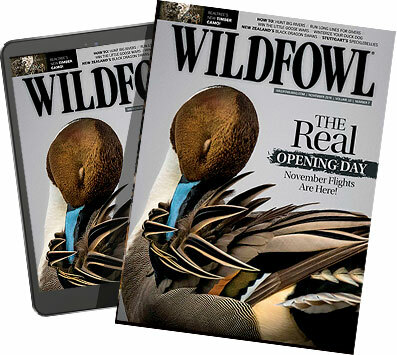 Finding a guide or outfitter, for those so inclined, is really no more difficult than doing an Internet search or paging through the ads in Wildfowl. Locating a guide or outfitter who is willing -- and even better -- sincerely enjoys chasing the white goose, can be another matter. Corresponding by e-mail is fine for initial inquiries, but it's vital that you actually speak with your prospective outfitter. The fact is there are those who will simply tell you what you want to hear, and others whose sincerity and enthusiasm, by manner of length and tone of conversation, will shine through. Even if you're hearing what you want to hear, take the time to speak with references to verify your inclinations. Stubbled up in the decoys. If you're a freelancer, be prepared to put in the time. At the minimum, count on spending at least as much time looking on that first trip, as you do hunting. You're going to spend a ton of windshield time scouting birds, and probably an equal amount locating often-absentee landowners and securing permission to hunt. Not that it's a bad thing, but the reality is it often takes years to find a productive area and cement lasting relationships with landowners. The good news, with the rare exception of the cattle rancher upset with the recent U.S. ban on Canadian beef imports, is that rural Canadian landowners are a pleasant and friendly lot who are generally receptive to the inquiry of courteous hunters. Freelancers, finally, are naturally drawn to the most-publicized snow goose staging areas. What they often find, however, is that so are major outfitting operations that have effectively sewn up access too much of the area's prime real estate. To avoid the frustration that results, freelancers will do well to concentrate their efforts in the countryside that lies at the fringe of the well-reputed "Big Bird" areas. Sure, you're apt to find fewer birds, but they will be less pressured and more huntable as a result. And you're far more likely to gain access to them as well. For those seeking a rendezvous with the white goose on the Canadian prairie, timing, if not critical, is certainly important. Probably the most predictable, most reliable snow goose hunting on the Canadian prairie coincides with the arrival of the first flocks down off the breeding grounds. On their first extended flight of the year the snows hop out of the arctic and sub-arctic in mid- to late-September, traveling in relatively small flocks that are still loose conglomerations of family groups. Once on the prairie they settle onto multiple roost ponds from which they need only make short flights to the just harvested, or still being harvested grain fields. It's at this time that they are most readily patterned, with flights consisting in great part of juveniles experiencing their first taste of hunting pressure; highly susceptible to a decent decoy spread. Snow goose concentrations generally peak across the prairies by mid-October. From that time on they tend to roost in ever-larger numbers, and move about the huge expanse of the prairie to avoid hunting pressure. As the season wears on, prairie hunters rely ever more on those nasty, snotty, bad-weather days for top quality hunts. When considering the timing of their hunt, light goose hunters should be aware that unlike with dark geese, all-day hunting of light geese is permitted for much of the season. Be sure to consult the regulations as they apply to that province you're hunting. The key when hunting snows, as with all waterfowl, is to set up where the birds want to be. (In other words, where they have peacefully fed the night, and ideally, the day before). If your scouted field has been holding a blend of dark and light geese, a mixed spread is entirely appropriate. In this case keep your dark decoys on the downwind edge of the rig, sprinkle a few snows in as you set into the wind and fill the entire upwind edge with white decoys. If the field you're going to hunt held primarily snows and blues, a mixed spread of snow and blue goose decoys set in relative proportion to the birds you spotted, is the ticket. Electronic callers are legal when hunting snows and blues in Manitoba and Saskatchewan in the fall. And they can be particularly effective early in the season and on foggy days. But if you use e-callers you're allowed to use only white decoys (dark or blue goose decoys are not permitted). A decent snow goose/blue goose rig should number 300-400 decoys, the majority of which can be silhouettes and windsocks. Some shells or full bodies will add substance, but aren't critical. If a spread of this size doesn't work, it's unlikely one, two or three times as big will either. Dealing with unpressured birds and favorable weather is always more important than raw numbers of decoys. Author's dog Tanner on the job. While pit blinds are the ultimate, today's low-profile layout blinds are far more practical, and when thoroughly stubbled, darn near as effective. Low-profile blinds not only provide concealment and protection from the elements, the fact that they limit a gunner's field of fire enhances safety as well. Still, particularly in an all-white spread, laying out hunters in whites may prove the best concealment strategy overall. When hunting snows, no matter how good your setup, don't expect to decoy the white tornado. Some bigger flocks will give you a look to be sure, but your shooting will almost invariably come from singles, pairs and small family groups. And your bag will no doubt consist primarily of the more gullible off-white juvenile snows and slate-gray juvenile blues. Taking a ratio of 10 juveniles to each adult is common. For those used to hunting low and slow-working Canadas, the shooting involved with the generally longer-ranged light geese is a whole new deal. Judging their distance is a unique challenge in its own right. Not only are snows smaller, simply due to their often-different ages, they vary widely in size. Factor in the likelihood of encountering some Ross's geese weighing in at only three to four pounds, and the gunner's dilemma is compounded even further. Then, too, the light geese are far more agile and aerobatic than darks. They commonly swing far and wide or kite high overhead as they study the rig. Then, just when you've come to expect this behavior, they'll suddenly and totally commit, tumbling right into the hunter's face. In general, however, big guns and heavy loads are required for the longer-range shooting that is a big part of the light-goose-hunting scenario. On tough days stealth can be everything when hunting white geese. To that end, a lot of hunters forego the use of dogs. Though they naturally have to be under control, we wouldn't think of hunting without ours. For the value the dogs add to the hunt aesthetically, not to mention the footsteps they save us practically, the few birds the dogs occasionally cost us are simply not a factor. And such was the case during that spectacular, Thursday morning stubble-field shoot. There was no letup in the snowstorm that charmed the day. Geese continued to work our rig from every conceivable angle and point on the compass. With high-coasting kiters, alternately diving and climbing crossers from both directions, and those crazy, hell-bent-for-leather whifflers tumbling wing over wing, the shooting was as tough, as easy and always as fast as any of us could want. Even as birds continued to work we finally had to call a temporary halt to the shooting. After a quick tally we found we lacked 10 for our legal, four-man 80-bird bag. Then, in only minutes, this just-over-two-hour, hunt-of-a-lifetime...this Boone-and-Crocket snow goose hunt...was in the books. There were high-fives all around as we agreed that a lifelong memory had been made. Now, if it sounds like I'm a fan of the Wild One...well...make no mistake about it! Hunt Snow Goose Central and see if you don't feel the same way.